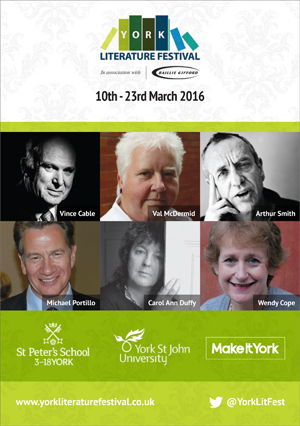 The York Literature Festival is huge and runs from 10th – 23rd March. I’ve already booked my ticket to see Carol Ann Duffy (I’m so excited!) and I’m eyeing up a few more rather impressive looking events too. There’s a poetry writing competition, Literary walks, talks, readings, theatre and so much more. It looks like it’ll be a superb couple of weeks so do make the most of the fact that we’re lucky enough to have it on our doorstep! The website is here and the programme is here. This entry was posted in Creative writing, Drama, English, Poetry, PREP and tagged Carol Ann Duffy, English tuition online, English tutor York, online english tutor, poetry, York English tutor, York Literature Festival. Bookmark the permalink.